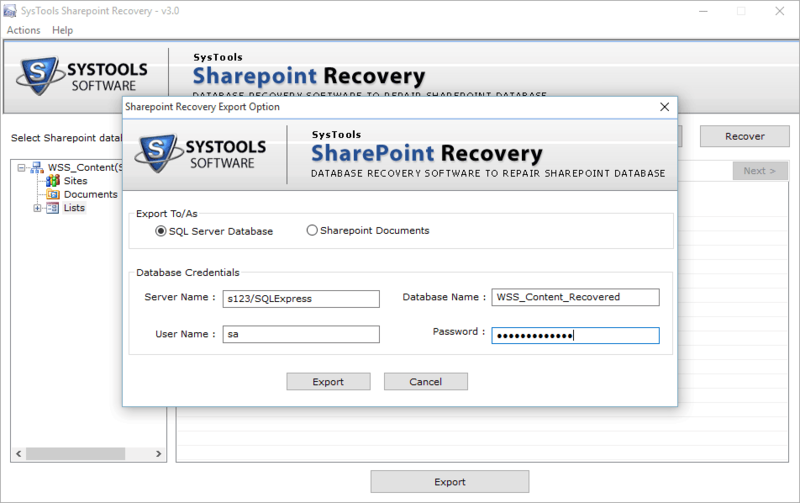 SharePoint Recovery Software simplifies the complexity related to repairing of SharePoint Database. In addition to that also performs the recovery of corrupted database. 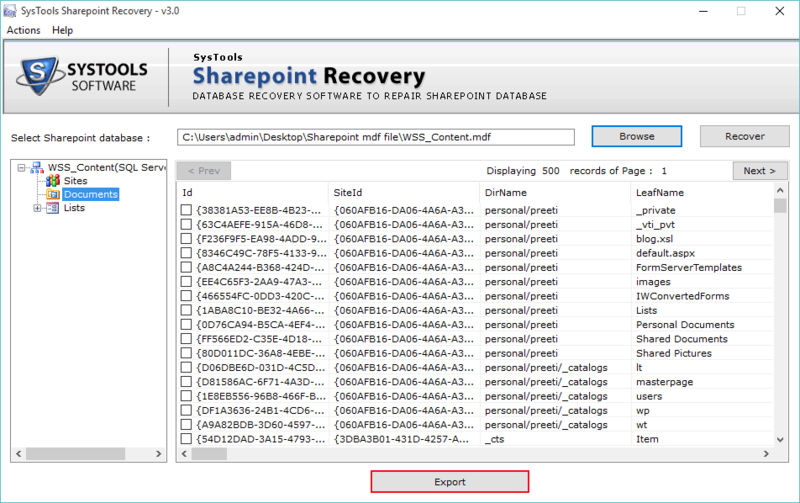 Restore SharePoint database Functions, Lists, Rules, Documents, Triggers etc. Quickly Scan & Preview Database along with properties. 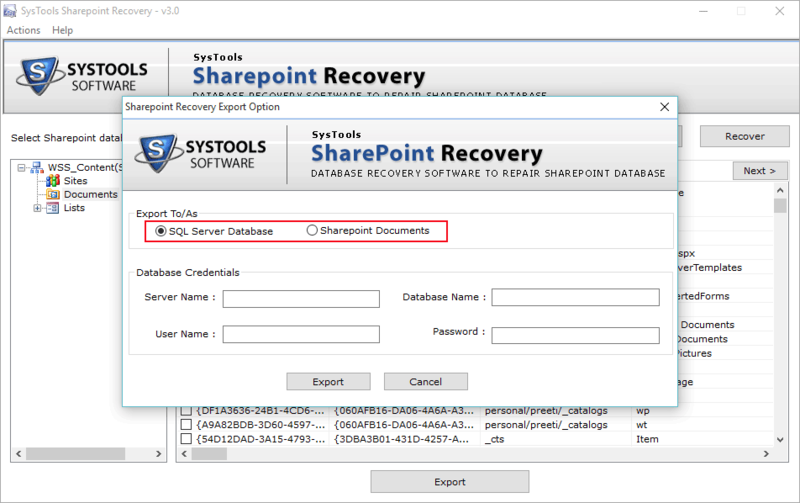 Save the recovered data as SharePoint Documents or SQL Server Database. Allows to export SharePoint data separately from database. 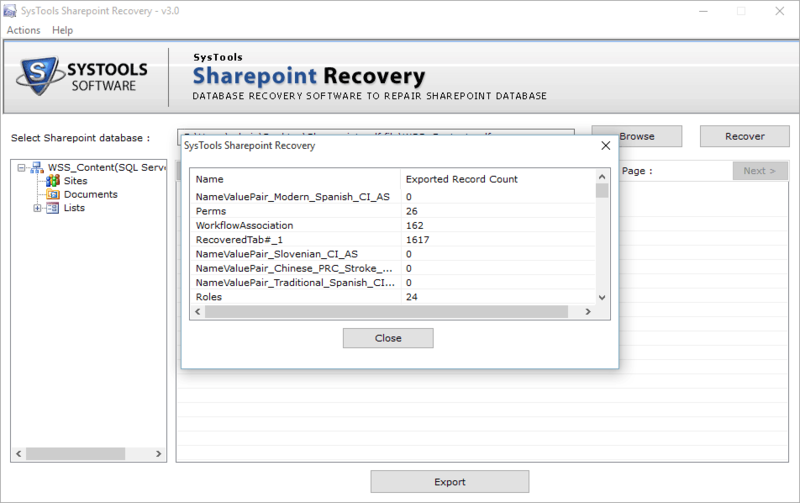 No need of SharePoint Server to recover damaged database. Presence of SQL Server is mandatory for the data to be exported. Supports SQL Server 2012 & below versions. 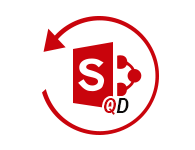 QuickData SharePoint Recovery Software enhances with the recovery of corrupted SharePoint database files. It restores entire data as sites, lists, workflow state, alerts, associations, metadata, permissions, Web part links, custom views etc. present in the SharePoint Database. 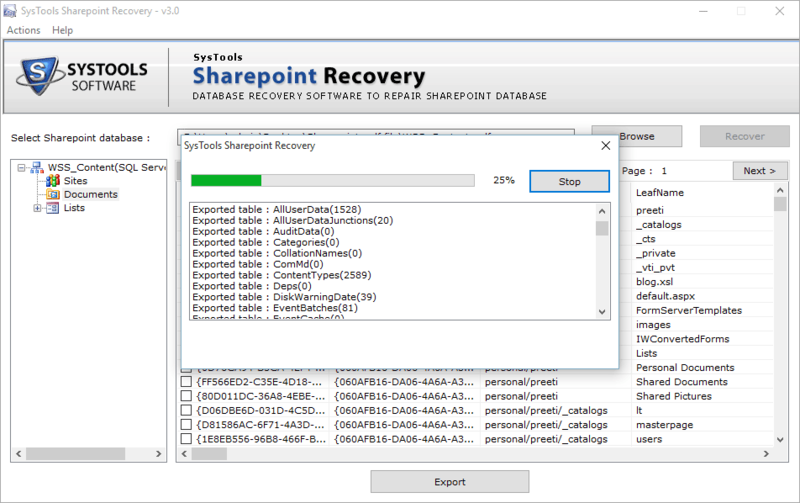 After selecting the SharePoint Database file for recovery, first the software scans whole database. In the mean time you will be able to view the entire scanning report.It enables you to show the details of database files like as: database name, count of tables, database versions, Pages read, Triggers, functions, Rules. Save in SQL Server Database: Allows you to directly export the SharePoint Database into SQL Server without providing any SQL Server credentials. Extract SharePoint Documents: All SharePoint data will get saved into a new Database file. 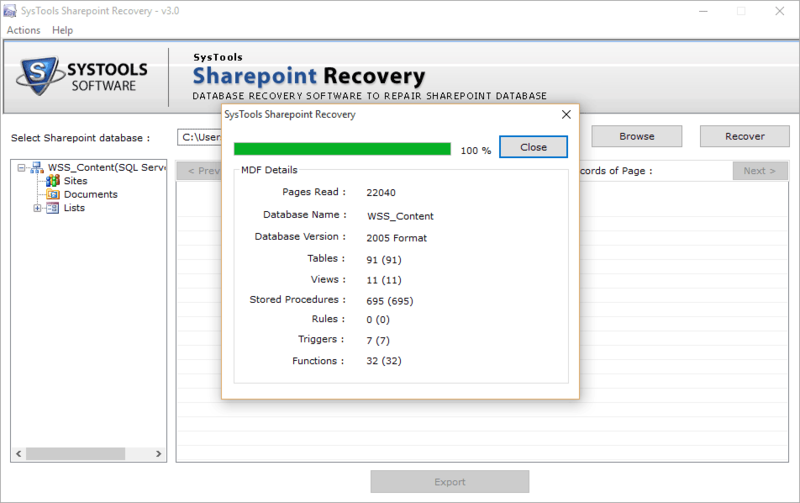 SharePoint Recovery tool allows you to quickly scan the corrupt or damaged .mdf files. After that, you can preview the entire data along with corresponding attributes i.e. Full URL, Site ID, directory name, Parent Web ID, Leaf Name etc. With the help of this utility, you can recover selected data as per your requirement. The only task you need to do is enabling the checkbox for the item you want to export. So, you will get an ease to repair the desired data item. -- The file cannot be opened. -- The list cannot be displayed in datasheet view. -- SharePoint containing the low hard disk space or RAM. -- Using Virtualized Microsoft SQL Server. -- Enabling the default settings of SharePoint Database. -- Using a single account for everything. -- Running service or web application on multiple distinct application pools. 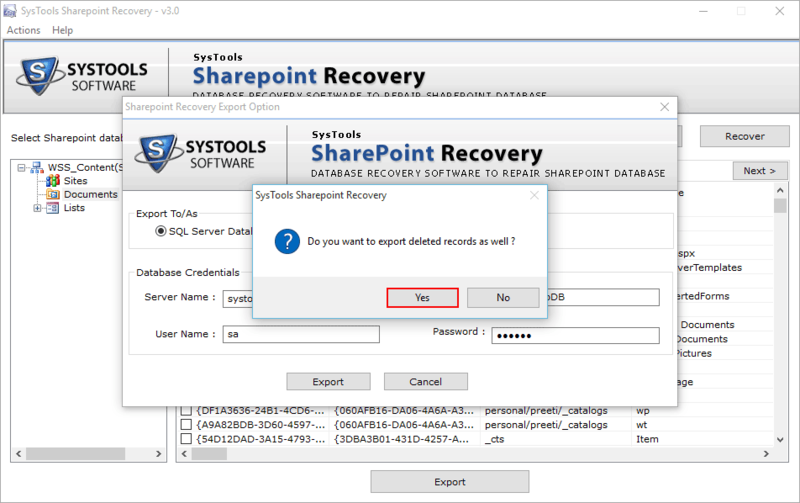 Demo version of the SharePoint Recovery tool previews and recovers entire data but does not allow to export them. Step 2: Hit the Browse button to select the file. Step 3: Select the file from the existing location and Click Open. Step 4: Click Recover to initiate the recovery process. Step 5: Recovery process will be started with displaying status report. Step 6: Now, Click on Export to save the recovered file. Step 7: In order to export SQL Server Database or SharePoint Documents, Enable the radio button accordingly. Step 8: Enter all the credentials of SQL Server like User Name, Server Name, Database Name, Password. Step 9: A message box will pop up. Select Yes or No accordingly. Step 10: Export progress report is also visible. Step 11: Number of records and tables that are exported will appear. Is it mandatory to install SharePoint to perform the recovery process? No, There is no need of SharePoint installation for recovery. What is the size limitation of database to recover? There is no size limitation of database to be recovered. How many database files can be repaired at a time? You can repair a single .mdf file at a time. I was in deep trouble with my corrupted SharePoint Server. Very much tortured with various tools suggested by different people. 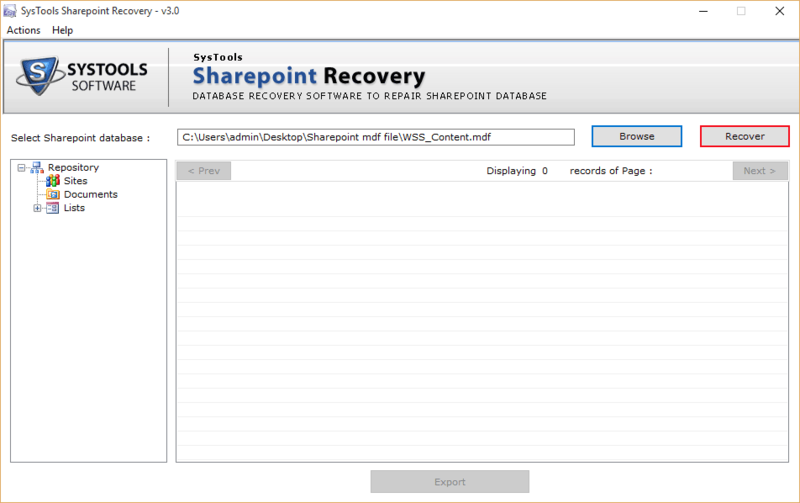 Finally, I got to know about QuickData SharePoint Recovery that helped me out with the repairing of SharePoint Server. Thanks for developing such a unique application for making the recovery of SharePoint Server so efficient and less time consuming. The best part is the assistance of the support team whenever required.